I came into an abundance of arugula recently and thought I’d make a pesto from it. I threw in a little leftover basil to maintain that “pesto” taste, but I think it turned out to be a fun alternative to the traditional pesto. It’s not overly intense, so feel free to modify to your own tastebuds. This recipe made over a cup of pesto, so feel free to freeze it in ice cube trays for that upcoming lazy day. The secret ingredient is the vegan parmesan from Veganomicon, which is amazing. Thanks, Isa! I refuse to buy vegan parm, it’s too expensive. Now I can make it on my own and it’s really tasty sprinkled on top of most everything. Arugula, also called rocket is a great green. It can tolerate the weather in the Pacific NW and grows really well. I love it in salads and on pizzas because it has a peppery edge and crunch to it. I think my first experience with arugula was at the Pink Door in Seattle, where they served it as a happy hour pizza without sauce, just olive oil, cracked black pepper and garlic. The arugula was just barely wilted and it was heaven. Sadly, their happy hour is now lame and not worth going to anymore. So grow some arugula and enjoy the many health benefits. It’s considered a cruciferous vegetable, so we’ve got the antioxidants and anti-cancer angle as well as vitamin a, c, folic acid and calcium. If that’s too healthy for you, wikipedia tells me an island in Italy makes a sweet, peppery liquor from it called rucolino. Maybe when I have a crop of arugula ready for harvest, I’ll figure out how to make rucolino and serve it alongside the pesto. 1. In a food processor (or blender), pulse arugula, basil, nuts, garlic, kelp and salt until it’s good and chopped. 2. With the machine running, pour in the minimum of olive oil. Take breaks to scrape down the sides. Taste the pesto and add more oil/salt to your liking. 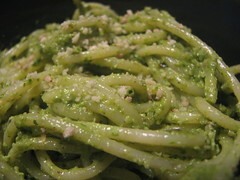 If it’s starting to taste oily but is not of pesto texture, add some water to the mix to thin it out. The end. Eat, enjoy, freeze what’s left. I found your site from Get Sconed, it’s great!